Oh, I guess it's not that bad. Santi Cazorla has been left out of Arsenal's Europa League squad and won't be available until Christmas with his, what is it, Achilles? Foot? Ankle? I don't even remember anymore. I miss Santi. In his press conference yesterday, Arsène Wenger said "we have no injuries," which omits Cazorla, but I see what he means. Jack Wilshere is short of match fitness, Alexis Sánchez had an ankle problem while on international duty with a Chile squad that lost two critical World Cup qualifiers without him, and there are still doubts over the available of fringe first-teamers Calum Chambers and Alex Iwobi. As for the predicted XI, well, we saw at Anfield that Wenger could put anybody anywhere for no reason. It's not like we have a square peg (Alex Oxlade-Chamberlain) to jam into a round hole (wing back) anymore. Callum Wilson suffered two separate cruciate ligament injuries inside of 16 months, first in September of 2015 and again back in February of this year, ruling out the Coventry-born striker. Wilson had two of the four goals Bournemouth scored against Arsenal last season, both from the penalty spot. Midfielder Junior Stanislas is out with a groin strain. Eddie Howe will be sweating on the fitness of Nathan Aké; the center back, who sealed a permanent transfer from Chelsea this summer, has an ankle injury. Aké spent the first half of last season on loan with the Cherries before being recalled by Chelsea in the second half. Meanwhile, Simon Francis, the captain, is a doubt with a hamstring problem. Speaking of players who transferred from Chelsea this summer, the Cherries now have Asmir Begović and switched to playing three at the back just before this last international break. If Aké doesn't pass fit, however, Eddie Howe may revert back to their 4-4-1-1 formation. Predicted XI: Begović, Cook, Aké, Mings, Smith, Daniels, Gosling, Surman, Arter, King, Defoe. And that goes for both teams! Arsenal are 16th in the table, but Bournemouth are 18th and have lost all three of their fixtures. Only Crystal Palace and West Ham are worse on goal difference. 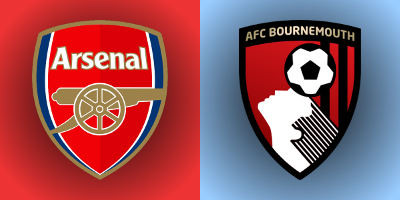 Bournemouth have never beaten Arsenal across five matches all-time, though they did hold a 3-0 lead in last year's meeting at Vitality Stadium. But let's start with this corresponding fixture last year, which Arsenal won 3-1. Alexis Sánchez opened the scoring on 12 minutes by pouncing on a poorly hit pass from Steve Cook that failed to reach goalkeeper Adam Federici. The Cherries, however, were level from the penalty spot on 23 minutes when Mike Jones ruled that Nacho Monreal fouled Callum Wilson. Arsenal were rattled, but did not concede another, and Theo Walcott scored the go-ahead goal from the back post on 53 minutes. Alexis added his second and Arsenal's third in the 91st minute. The match at the Vitality, however, was insane. The Cherries struck twice in four minutes, with Charlie Daniels scoring the 16th minute and Wilson again converting from the penalty spot in the 20th, this time from a clumsy Granit Xhaka challenge. Ryan Fraser made it 3-0 to the hosts just before the hour mark. 20 minutes from time, Alexis Sánchez pulled a goal back for Arsenal after a flick-on from Olivier Giroud. Five minutes later, Lucas Pérez curled a volley inside the post (also from a Giroud assist) to make it 3-2 and in the 82nd minute, Bournemouth captain Simon Fraser was sent off. Two minutes into the six minutes of added time, Olivier Giroud headed in an equalizer. While Arsenal battled resiliently to take a point from a 3-0 deficit, that match was the first sign that 2017 was going to be a dreadful year in Arsenal's world. The referee is Cheshire-based Anthony Taylor. You're likely well aware that Arsenal have had what I call "a colorful history" with Taylor, though their overall record stands at 13 wins, five draws, and only two losses. Last year, Arsène Wenger called Taylor "dishonest to [his] federation" and then shoved him, but Taylor was the fourth official that day. In the three Arsenal matches that followed in which Taylor worked as the referee, Arsenal won all three: 5-0 over Lincoln City, 2-1 over Middlesbrough, and 2-1 over Chelsea in the FA Cup Final. Bournemouth did not see Taylor last year, but were unbeaten in their two matches with Taylor the season before that, including a 2-1 win over Manchester United and a 0-0 draw at Watford. John Painting is a contributing writer to the Modern Gooner and a small constellation in the Southern Celestial Hemisphere. You can follow him on Twitter @zorrocat for signs of alien life.